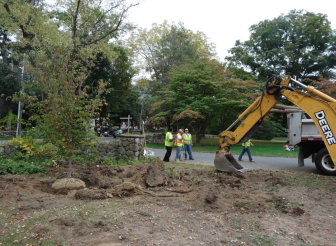 The three photos below were taken on Tuesday, September 30, 2014 by Judy Neville when the New Canaan Garden Club Irwin Park Committee installed five new trees at the Park entrance with the help of the town backhoe and Parks Superintendent John Howe, Highway Superintendent Mose Saccary and Tiger Mann. 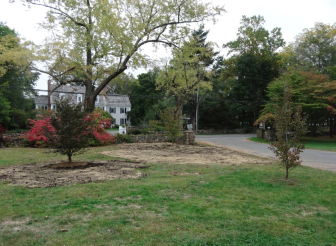 In 2005 the garden club members accepted the stewardship of New Canaan’s newest park on Weed Street from the Irwin Family when the club members were given an endowment fund to continue the beautification of the property/park and improve the quality of life in our already special town. The garden club gladly collaborates with the Park and Recreation Commission, the Office of Selectman and the Public Works crew on the maintenance and beautification. 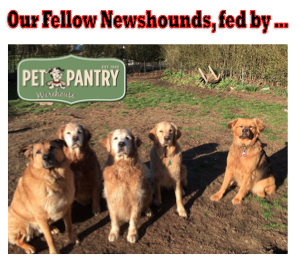 Annually improvements and new projects have been undertaken using the funds. Although the latest path extension this past spring was funded by monies previously raised specifically for the original 1-mile path. New benches, chairs, picnic benches, a gazebo, thousands of daffodils on the great lawn and numerous trees have been planted to the delight of all who jog, ride bicycles, walk with their dogs (and pick up after them) and just rest along the paths and on the Great Lawn beyond the apple orchard. Additional open space provides playing fields for sports on weekends and a special Children’s Mushroom Maze Garden is tucked in near the charming, old barn. Bluebird houses are sprinkled around the property in the meadows. The Gores Pavilion, which was the original pool house on the property, designed by one of the famed “Harvard Five” architects, has been independently restored by the New Canaan Historical Society and is open to visitors Friday through Sunday, May through October 11:00-3:00 with changing photography exhibits. The Irwin Park property is listed annually in “The Garden Conservancy Open Days Directory” along with another New Canaan Garden Club restored civic project- The Walled Garden designed by renowned landscape architect Frederick Law Olmsted adjacent to Waveny House in Waveny Park.